Having players who set strong, legal screens is crucial for any basketball team. Basketball screens are a great way to get players open to receive the basketball and give your team an advantage on offense. 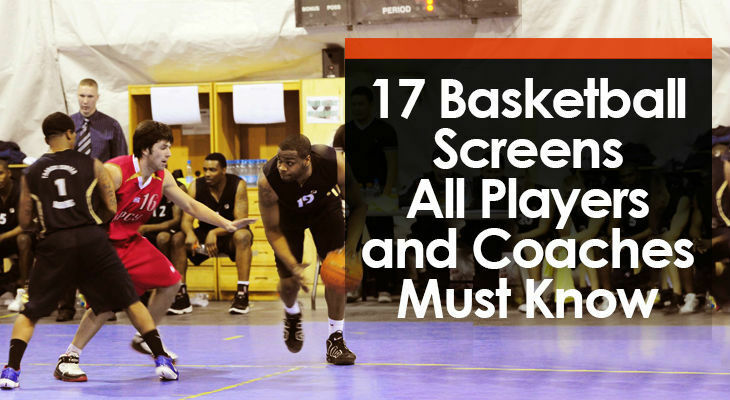 "What is a basketball screen?" When a screen is set, the screener's teammate will have a better chance of getting open because their defender will have to avoid the screen before getting back into defensive position. And it's the reason why you'll see basketball screens being set nearly every single time down the floor at all levels of basketball. From your local U10's competition to the NBA. The back screen involves an off-ball player setting a screen behind a teammate’s defender. This will often catch the defender unaware and allows the offensive player to cut towards the basket where they can receive the pass and finish with an open layup. a. 4 steps out of the low post and sets a screen on 2's defender. b. 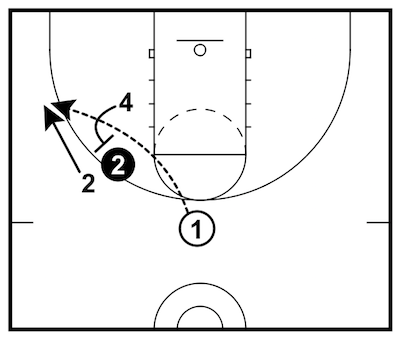 2 cuts backdoor towards the hoop. c. 1 passes to 2 for the open layup. A ball screen is a broad term for any basketball screen set for the player who is currently in possession of the basketball. This is one of the best ways in basketball to create an offensive advantage. a. 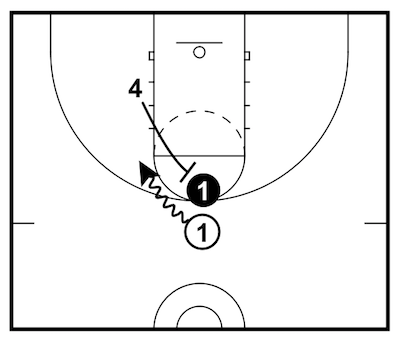 4 comes out of the low posts to set an on-balls screen on 1's defender. b. 1 uses the screen and attacks the hoop. A cross screen occurs when a player cuts to the opposite side of the floor to set a screen for a teammate. This most commonly happens in the paint and can be a great way to get a player who was on the weak side of the floor open for a quick shot or layup. a. 2 cuts across the paint to screen 4's defender. b. 4 cuts towards the strong side of the court. c. 1 passes inside to 4 for an open layup. A double screen involves two players setting a screen side-by-side. This makes it more difficult for the defender of the player receiving the screen, but also means there will be more of the opposition’s defenders in a small area. a. 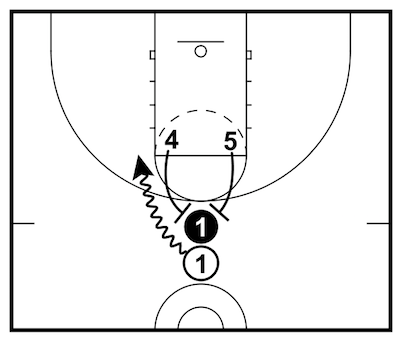 3 and 4 set a double screen shoulder-to-shoulder. b. 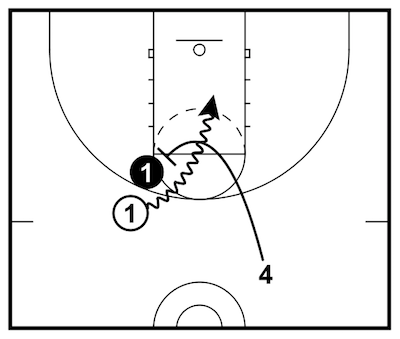 2 curls around the two screens and pops out to the three-point line. c. 1 passes to 2 for the open three-point shot. A down screen (also known as a pin down) is any screen set that involves the screener facing their chest towards the baseline. This results in the players receiving the screen cutting away from the hoop which is why they’re mostly used to get shooters open on the perimeter. a. 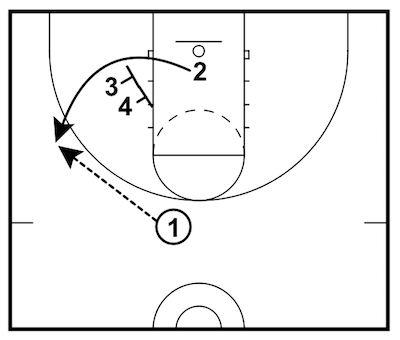 4 steps off the high post and sets a down screen for 2.
b. 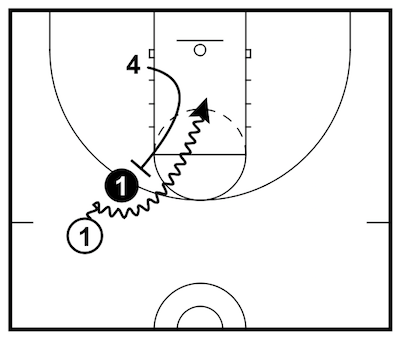 2 walks their defender towards the hoop and the explodes out to the perimeter. A drag screen is an on-ball screen set by a trailing offensive player in transition. This screen is effective because the screener’s defender won’t usually be in good position and will be unable to provide help on the ball-handler. a. 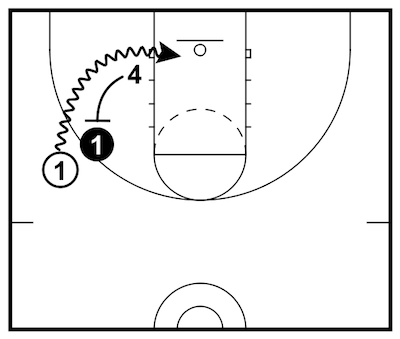 4 sprints down the court in transition and then screens 1's defender. The elevator screen (also known as a gate screen) is set by two players and involves the player receiving the screen cutting between players who then quickly step together to ‘close the gate’. This allows the offensive player to cut in a direct line while their defender must navigate around two other players to get back in defensive position. a. 3 and 4 come together to set an elevator screen for 2.
b. 2 sprints through the two screens and then pops out to the perimeter. c. As soon as 2 has made it through, 3 and 4 step together to close the gate. d. 1 passes to 2 for the open three-point shot. A flare screen is an off-ball screen that allows a player to cut away from the basketball to a spot somewhere around the perimeter. If an on-target skip pass is made, this is a great basketball screen for getting the team’s best shooters open for outside shots. a. 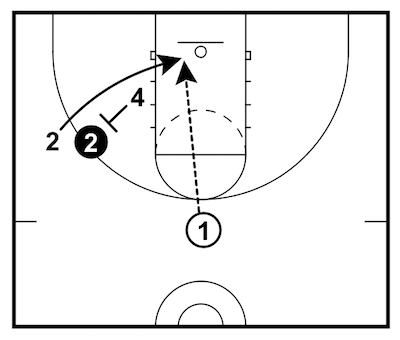 4 steps out of the low post to set a screen behind 2's defender. b. 2 cuts from the wing towards the baseline. c. 1 skip passes over the top to 2 who should be open for a three-point shot. A flat screen involves a player setting a screen for the player with the basketball while their back is facing towards the basket. This can be a very difficult screen for the on-ball defender to avoid, especially if the ball-handler is moving quickly and looking to attack the rim. a. 4 steps off the block and sets a screen directly behind 1's defender. b. 1 fakes left and dribbles back towards the middle of the court. A flex screen is set on the weak side of the floor and allows the offensive player receiving the screen to cut along the baseline into the paint. This basketball screen comes from the ‘flex offense’. a. 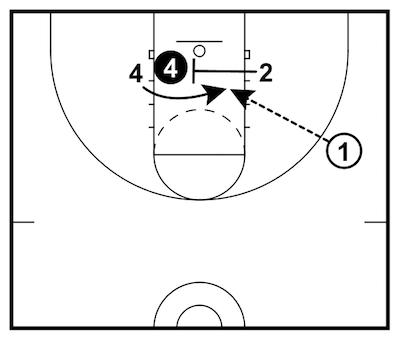 4 sets a screen on 2's defender. b. 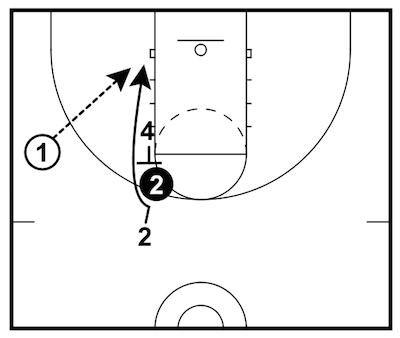 2 cuts along the baseline into the paint. When running a floppy screen, a shooter starts in the middle of the paint. A single screen set on one side of the floor, and a staggered screen set on the other side of the floor. The shooter must read their defender and then can decide which direction they want to cut. a. 3 and 4 set a staggered screen on the left side of the court. b. 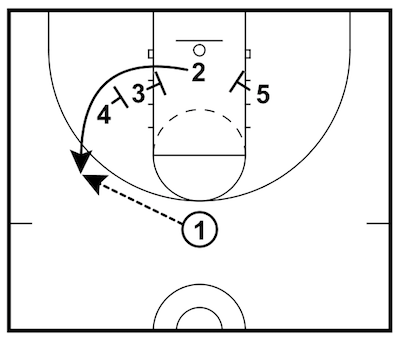 5 sets a single screen on the right side of the court. c. 2 reads their defender and can choose to cut either side. d. 1 passes to 2 for the open shot. The hammer screen is a variation of the back screen and involves a player setting a screen on the weak side of the court which allows their teammate to cut to the corner for an open shot. This is a great basketball screen to get shooters open as it often catches the defense unaware. a. 1 drives past their defender and towards the baseline. b. As this happens, 2 steps up and sets a back screen on 2's defender. c. 2 cuts to the corner. d. 1 passes along the baseline to 2 in the corner for the three-point shot. A horns screen occurs when two off-ball players set an on-ball screen on either side of the ball-handler’s defender. This usually happens at the top of the key and gives the dribbler the option to attack going left or right depending on what the defense is giving them. a. 4 and 5 step up and set screens on either side of 1's defender. b. 1 reads their defender and then picks a side to attack. 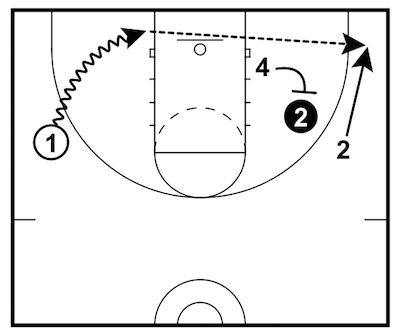 A ram screen involves and off-ball screen that leads immediately into an on-ball screen. This is an effective action because it’s difficult for the defender getting screen in the first action to recover quickly enough to provide good help on the ball-handler in the on-ball screen. a. 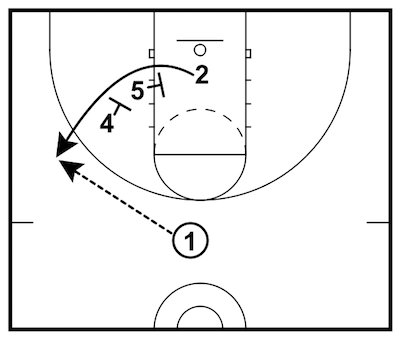 4 sets a screen on 5's defender. b. 5 cuts to the top of the key and screens 1's defender. c. With 5's defender being slow to help, 1 quickly attacks. A staggered screen occurs when two players set a screen for a teammate but they’re not immediately next to each other (that’s a double screen). Instead, one player is in front while the other player is a step or two behind them. a. 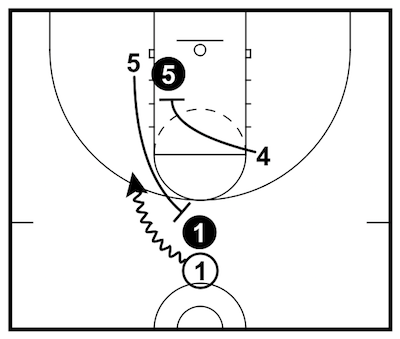 5 sets a screen on 2's defender. b. 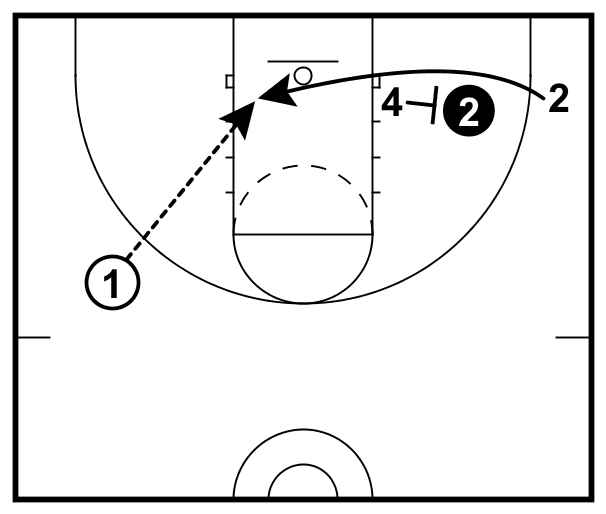 4 sets another screen behind 5 and hunts for 2's defender once they evade the first screen. c. 1 passes to 2 on the perimeter for the open shot. A step up screen involves a player stepping out of the low post to screen for the player with the basketball to attack the baseline. The screener should make sure to have their back towards the baseline. a. 4 steps off the block to set a screen on 1's defender with their back to the baseline. b. 1 drives towards the baseline. The UCLA screen is a variation of a back screen. It’s set at the high post elbow and allows a perimeter player to cut towards the strong side block. This screen was made popular by John Wooden’s UCLA offense during the 50’s and 60’s. a. 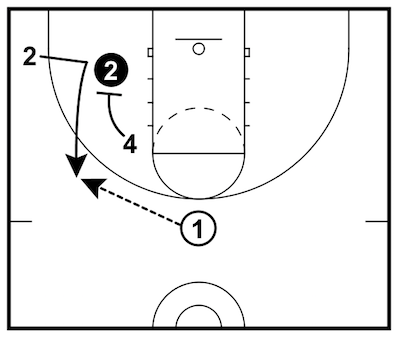 4 sets a screen on 2's defender on the high post. b. 2 cuts from the slot position towards the strong side block. 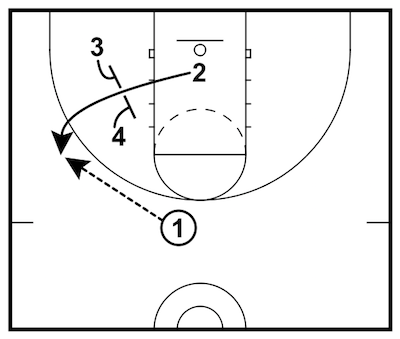 c. 1 passes to 2 for a post up or layup. There are 5 keys to setting a great basketball screen for a teammate. Put your defender in a difficult position by creating separation between yourself and them before setting the screen. Doing so makes it difficult for them to provide good help on the dribbler or the cutter. a. Don’t telegraph the screen. b. Sprint to set the screen. c. Use a ‘Ram Screen’ (#14 above). As I’ve said many times before, the angle is the most important part of an effective screen. Few coaches emphasise the importance of the screening angle and very few players focus on setting a screen on the best angle possible. When setting an on-ball screen, set the screen on the back hip of the on-ball defender. When setting an off-ball screen, set the screen with your back facing the direction you want you teammate to go. Following these two guidelines will make your screen effective in 98% of cases. A player must make sure they’re making physical contact with the opposition player when setting a screen on them. If there’s no contact, it’s too easy for the defender to step around the screen and quickly get back into good defensive position. The screen will never be effective if it’s easy to knock the screener off balance. Teach your players to set the screen with their feet shoulder width apart, knees slightly bent, and arms tucked in close to the body. The aim of the player setting the screen should be to hold their position until the defender has managed to evade the screen. Don’t make it easy for the defense by conceding your spot too soon. But, make sure you don’t get called for a moving screen! Anyone can set a strong, effective basketball screen. The players who set the best screens aren't necessarily the tallest or strongest players, the best screeners are the players who WANT to set a good screen. They're the players who take pride in getting their teammates open. As coaches, we must do a better job of teaching our players how to set effective screens and also teaching them how important they are to play great basketball.